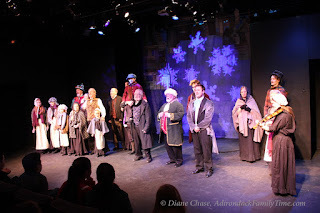 (Saranac Lake) You don’t have to believe in Santa or even celebrate Christmas to walk out of Pendragon Theatre’s A Christmas Carol by Charles Dickens knowing it’s never too late to make change for the good. Director Kent Streed pulls together a stellar cast for this classic tale of redemption and generosity. Kudos to Kent Streed who wears many hats in this classic production from set and costume designer to director. His light-handed approach allowing the simple message that everyone can make a difference and help others, is paramount this holiday season. 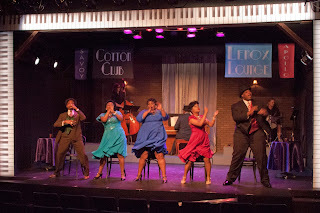 The sets are simple blacks and greys, allowing the audience to focus on the actors’ motion. The gauze backdrop transforms into a busy London street, a window into the future or a snowy evening sky. 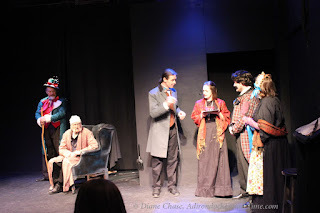 Narrator Christopher Leifheit and Fiddler Alicia Bodmer set the tone as we are transported back to Victorian London where Ebenezer Scrooge (Burdette Parks) callously works his clerk (Paul Van Cott) on the night before Christmas. Parks’ Scrooge is so stingy in action and deed that even his extremities are tightly curled. He barks and rages when it comes to charity and holidays. 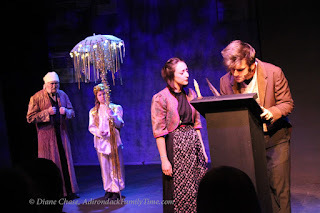 That evening Scrooge, visited by the ghost of his long dead partner Jacob Marley (Dylan Van Cott), finds that he too “wears the chains I forge in life.” Bonnie Brewer’s lighting, wisps of fog along with Van Cott’s haunting tone create an atmosphere of dismay. 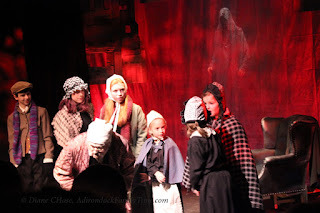 Streed strategically uses young actor Morgan Olsen in the role of The Ghost of Christmas Past. Olsen’s angelic face and stoic actions help to drive home the message that "happiness given is as great as if it cost a fortune." Through whirlwind trips through Scrooge’s past, we are shown glimpses of how he began to honor money over charity, friendship and love. There are many poignant vignettes throughout the One Act play. 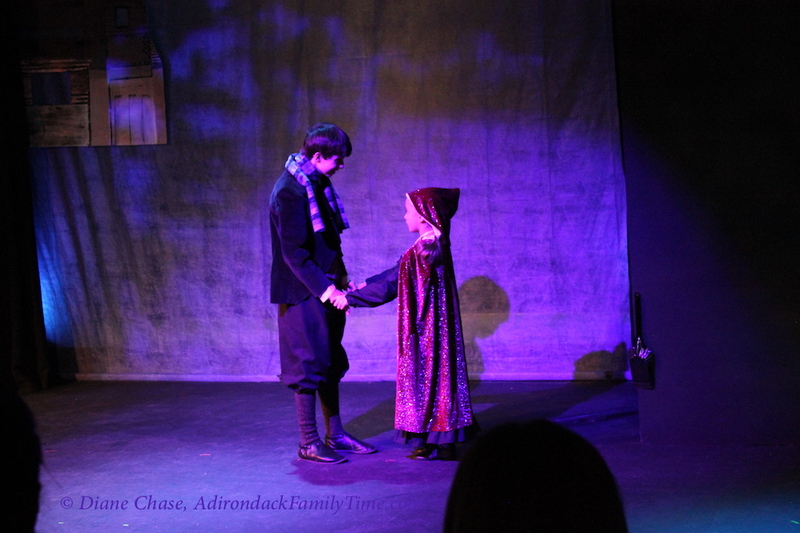 The quick exchange between a lonely child Scrooge (Galen Halsaz) comforted by his younger sister Fan (Lilly Grace Kipping) jerks at the heartstrings. The holiday delight the Fezziwigs (Peggy Orman and Barry Ramsey) share with their staff remind us to look for happiness in even the smallest things. By the time Christmas Past shows us a grown Scrooge (Lucky Cerruti) we see glimpses of the miser who so easily discards love for mere pennies. Scrooge how his actions have shaped his life. The Ghost of Christmas Present (Stephen De Hond) sweeps into Scrooge’s room and interacts with the audience highlighting all of Scrooge’s missed opportunities. De Hond’s Ghost is a jovial spirit bringing Scrooge to Nephew Fred’s house where he hears how family and their friends pity him. At stop at the the Cratchett house, where money is scarce and love is abundant, is where Scrooge learns that even a deathly ill Tiny Tim finds hope in the every day. It’s not all hauntings and hard lessons learned. There are touches of comic relief throughout the performance. Look for cartwheeling Fezziwigs, cackling old cronies, an adorable cast of children, an off-key guest (Joy Cranker), of course Topper (Dylan Van Cott) and a hesitant businessman’s (LuckyCerruti) encounter with Scrooge. These and many more incidents pull giggles from the audience. 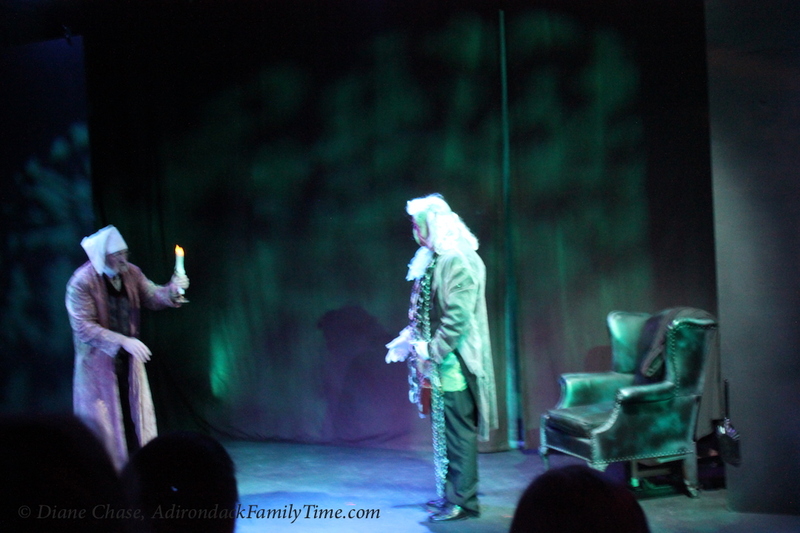 The Ghost of Christmas Future depicts a grim future for Scrooge. Even though we may all know how the story plays out, we are all routing for Scrooge to choose a generous path. Parks’ Scrooge unfolds before our eyes from a rigid old man to a jovial well-wisher, who has us believing that people can change if given a chance. There are only a few more chances to see Pendragon Theatre’s A Christmas Carol. If you need a reason to go then go because it’s a chance to face our own ghosts and be given a second chance. Go because of this talented cast. Go because it’s an opportunity to share live theatre with family and friends. Happy Christmas!